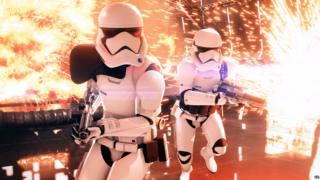 During the game, players have to obtain credits - either by buying them or through long hours of game play - to unlock popular characters including Luke Skywalker and Darth Vader. "Unlocking a hero is a great accomplishment in the game, something we want players to have fun earning," said executive producer John Wasilczyk from the developer Dice, in a statement. "We used data from the beta [testing period] to help set those levels, but it's clear that more changes were needed." The change will be effective from today, he added. The credit system has faced huge criticism from the game's fans. The game without any of the extras is available for pre-order for between £49.99 and £69.99 in the UK, which many felt meant there should not be additional payments for the most popular Star Wars characters. A post by EA on community news site Reddit, explaining the reasons for the original rule, has become the most "down-voted" in the site's history. The post explained that the rule was intended to "provide players with a sense of pride and accomplishment for unlocking different heroes". The post currently has a score of - 639,000 points - which is a total of the number of "upvotes" (those who liked it) minus the number of "downvotes" (those who didn't). According to Reddit's own statistics the previous most unpopular post had a score of -24,333 and that was a message which asked people to downvote it. A Twitter use claiming to be one of the game's developers, posting from a locked account, said he had received seven death threats and more than 1,600 "individual personal attacks". However, doubts have since been cast on the authenticity of this claim.